PYTHAGORAS - from The Ethics of Diet, Howard Williams, 1st published 1883, text from the 2nd edition, 1896. Greek philosopher and mathematician. He founded a religious brotherhood, which followed a life of strict asceticism and greatly influemced the development of mathematics and its application to music and astronomy. 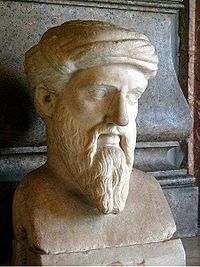 The first prominent modern vegetarian was the Greek philosopher Pythagoras who lived towards the end of the 6th century BC. The Pythagorean diet came to mean an avoidance of the flesh of slaughtered animals. Pythagorean ethics first became a philosophical morality between 490-430 BC with a desire to create a universal and absolute law including injunctions not to kill "living creatures," to abstain from "harsh-sounding bloodshed," in particular animal sacrifice, and "never to eat meat." And barbarously renew Cyclopean feasts? . . . . . . . . . . . . . . .attributed by Ovid. The souls of animals called unreasoning are reasonable, not however with active reasoning powers, because of an imperfect mixture of the bodies and because they do not have the power of speech, as in the case of apes and dogs; for these have intelligence but not the power of speech. And it is said that Zaratas forbade men to eat beans because he said that at the beginning and composition of all things when the earth was still a whole, the bean arose. And he says that the proof of this is that if one chews a bean to a pulp and exposes it to the sun for a certain time (for the sun will affect it quickly), it gives out the odour of human seed. And he says that there is another and clearer proof: if when a bean is in flower we were to take the bean and its flower, and putting it into a pitcher moisten it and then bury it in the earth, and after a few days dig it up again, we should see in the first place that it had the form of a womb, and examining it closely we should find the head of a child growing with it. Pythagoras laid down the doctrine of the monad and of foreknowledge and the interdict on sacrificing to the gods then believed on, and he bade men not to partake of beings that had life, and to refrain from wine. And he drew a line between the things from the moon upwards, calling these immortal, and those below, which he called mortal; and he taught the transmigration of souls from bodies into bodies even as far as animals and beasts. 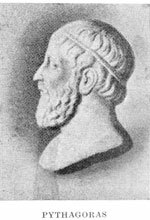 Pythagoras the Samian, son of Mnesarchos, said that the monad is god, and that nothing has been brought into being apart from this. He was wont to say that wise men ought not to sacrifice animals to the gods, nor yet to eat what had life, or beans, nor to drink wine. And he was wont to say that all things from the moon downward were subject to change, while from the moon upward they were not. And he said that the soul goes at death into other animals.